EaseFilter File system encryption filter driver SDK provides a comprehensive solution for transparent file level encryption. It allows developers to create transparent encryption products which it can encrypt or decrypt files on-the-fly. EaseFilter File system encryption filter driver SDK provides a comprehensive solution for transparent file level encryption. It allows developers to create transparent encryption products which it can encrypt or decrypt files on-the-fly, it can allow only authorized users or processes can access the encrypted files. Supported strong cryptographic algorithm Rijndael is a high security algorithm which was chosen by the National Institute of Standards and Technology (NIST) as the new Advanced Encryption Standard (AES), it can support key length 128-bits,192-bits and 256-bits.EaseFilter File System Mini Filter Driver SDK is a mature commercial product. It provides a complete modular framework to the developers even without driver development experience to build the filter driver within a day. 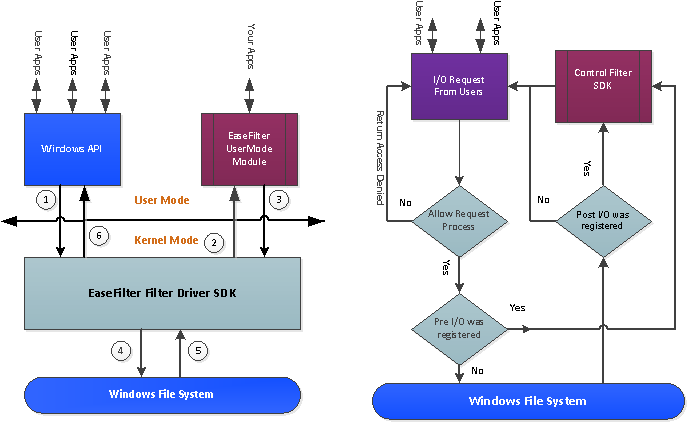 The SDK includes the modules from code design to the product installation, it includes all the basic features you need to build a filter driver. The IDAutomation .NET Font Encoder Assembly & DLL is a Font Tool that is used to format strings for IDAutomation Barcode Fonts in the Microsoft .NET Framework. This product supports all standard bar code fonts as well as the Universal Font. BasicVideo is a set of .NET 2.0-4.0 components for fast video capture and playback. Allows implementing capture and playback with zero lines of program code. The library supports large number of formats and technologies. Free for non-commercial use. Ninja Database Pro is an ACID Compliant .NET Database for Windows Phone 7, Silverlight, and desktop. Features: LINQ, transactions, caching, triggers, indexes, encryption, compression, import XML, export XML, export schema, and more. Try it today.